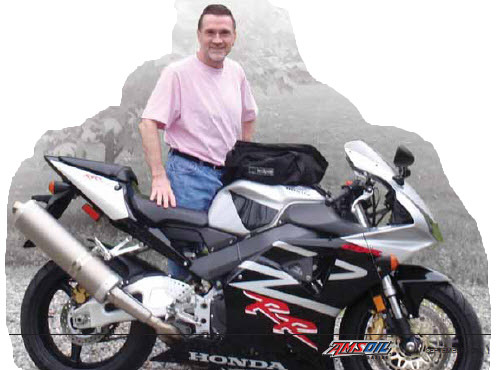 Kevin Harrington of Stratham, N.H. began using AMSOIL Synthetic Motorcycle Oil this year and was eager to tell others of his experience. Advanced multi-functional formula for domestic and foreign motorcycles. For high-performance liquid or air-cooled fourstroke engines and transmissions and four-and two-stroke motorcycles. A technician told Harrington when he bought the bike nearly 10 years ago that shifting would be “clunky as a normal condition.” According to Harrington, the wet-clutch lubricity has improved shifting smoothness significantly. “AMSOIL Synthetic Motorcycle Oil for wet-clutch applications has eliminated the shifting clunkiness and the accompanying noise when shifting,” Harrington said. The motorcycle also ran cooler. AMSOIL Synthetic Motorcycle Oil has made noticeable improvements in the Honda’s operation. new user of AMSOIL 10W-40 Synthetic Motorcycle Oil.